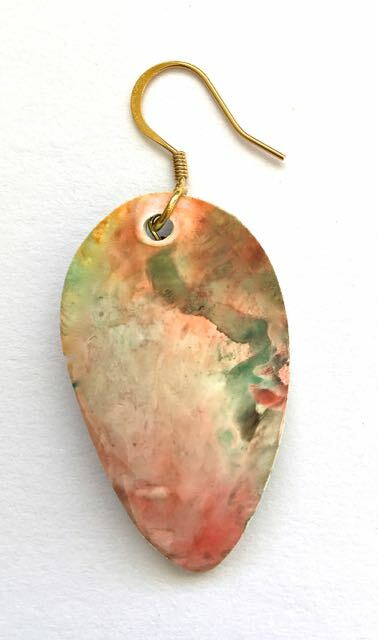 If you have ever enjoyed finger painting as a child, you're going to love this earring technique. I was inspired by the aptly named book, "Color Inspirations" by Lindly Haunani and Maggie Maggio. I highly recommend this publication. You'll find a link to it on Amazon in the Supplies section at the bottom of this page. 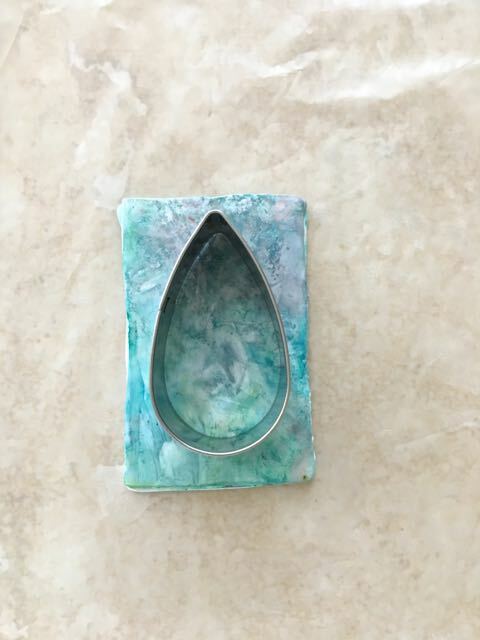 While finger paints are created with paint and paper, what I used here are alcohol ink and polymer clay. But mixing the colors is just as much fun as finger paints. 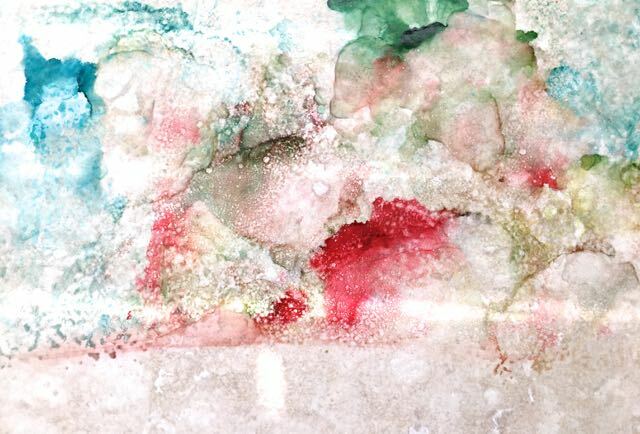 Ink colors are dripped onto a ceramic tile which becomes your palette. 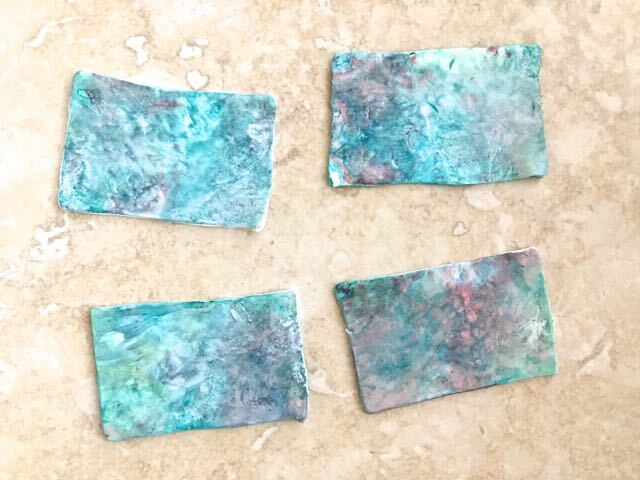 While alcohol ink dries out quickly, nothing is wasted. A spritz with Isopropyl alcohol and you have more color to work with. 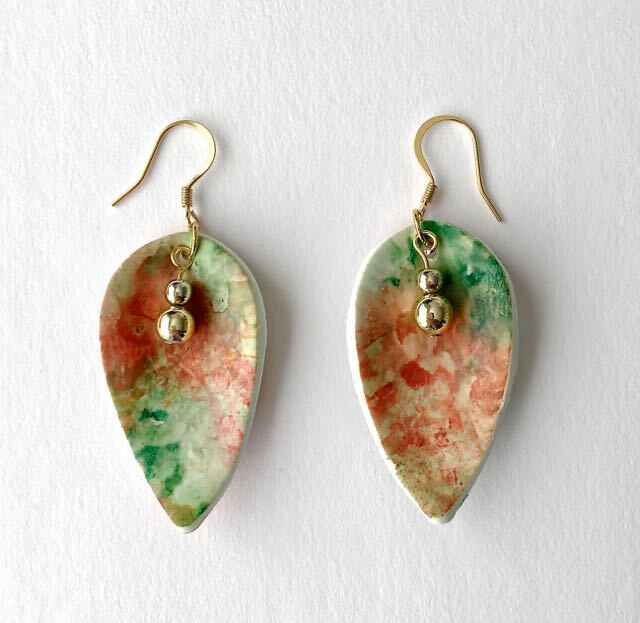 The earrings are made with two layers of clay to result in color back to back. Set the finished clay inside the bowl of a spoon and bake in your kitchen oven. The color and design possibilities are limited only by you! step 1 - Roll white clay on the #3 setting of the conditioning machine. Cut four rectangles to measure 2.50" x 1.50" minimum. This will provide a piece large enough for the 1.75" long teardrop shaped cutter. step 2 - There is no one way to arrange your ink. A couple of drops of each color is all you need. For the blue earrings I put down blue, blue and green together, and green. I also added a bit of red (not shown). 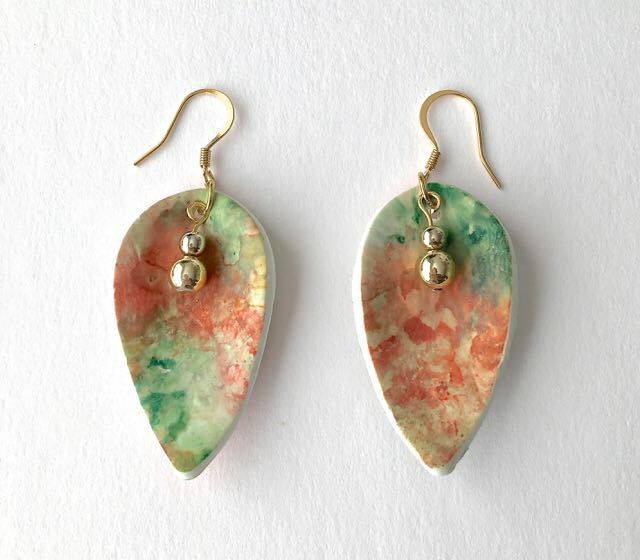 step 3 - For the green and orange earrings, I added yellow. This is what the dried ink tile looked like after I colored the clay. While it may seem like a mess, a light spray with with alcohol will make it fluid and workable again. step 4 - Wearing gloves while you work will eliminate the fear of getting ink on your hands. To color the clay, press the surface into the ink. Dab it, swirl it around, or use your own technique. You'll quickly realize how easy it is to create fabulous color combinations. step 5 - The first time you put the clay onto the alcohol the color will be thin. The ink dries quickly and setting the clay down again will build on that first layer. For deep colors, add a light spray of alcohol. For paler colors dilute the ink with a stronger spray. step 6 - As you can see, no two pieces will be identical in color. But that's what makes this technique so interesting. From the four pieces, choose the two you like best for the earring fronts. 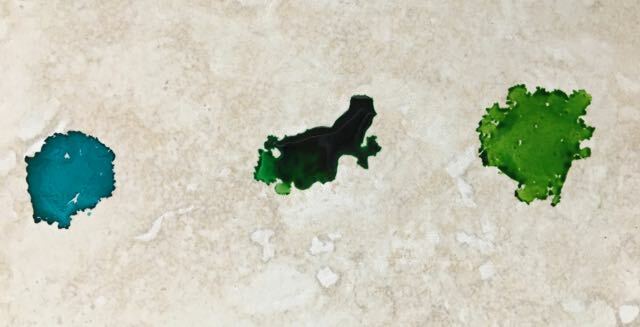 step 7 - Place your two least favorite pieces ink side down on your work surface. Place your favorites over them. Press the cutter into the clay. step 8 - With a mini hole cutter create holes in the center top of the pieces. The front and back pieces have color and the sides are white. I liked that effect. Use a colored clay for your base if you don't want white edges. You can also paint edges with a different color ink and a brush. step 9 - Place the clay in the bowl of a small spoon with the widest part against the tapered end of the spoon. (See tips on spoons and shapes below). Bake the spoons on parchment paper in a 275 degree oven for 30 minutes. Allow the clay to cool. Carefully pry the clay from the spoon. Apply a glaze to the clay if desired. step 10 - Slip a nailhead wire into a 6mm then a 4mm ball bead. Create a loop in the top of the wire and cut away excess. Click here if you are unsure of how to make a loop. 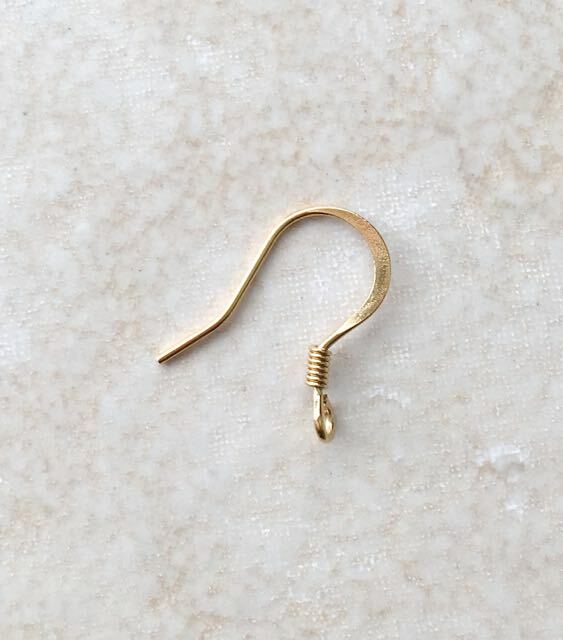 Connect the loop to the earring with a 7mm jump ring. step 11 - Grasp the earring wire with pliers and with a second set of pliers, turn the loop 90 degrees so that it will face the right direction to slip into the jump ring. step 12 - The adjusted earring wire will allow the earrings to hang straight with the concave shape facing forward. 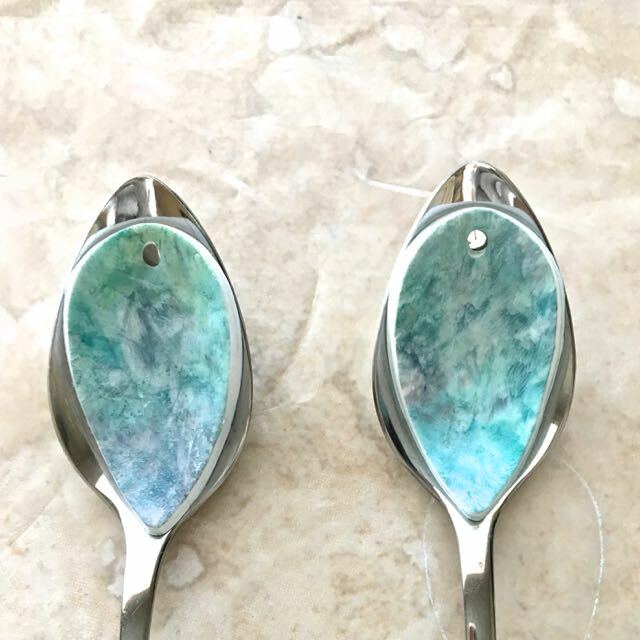 A smaller spoon will create a very obvious vertical curve. For less curve on a small spoon, place the point of the clay at the point of the spoon. 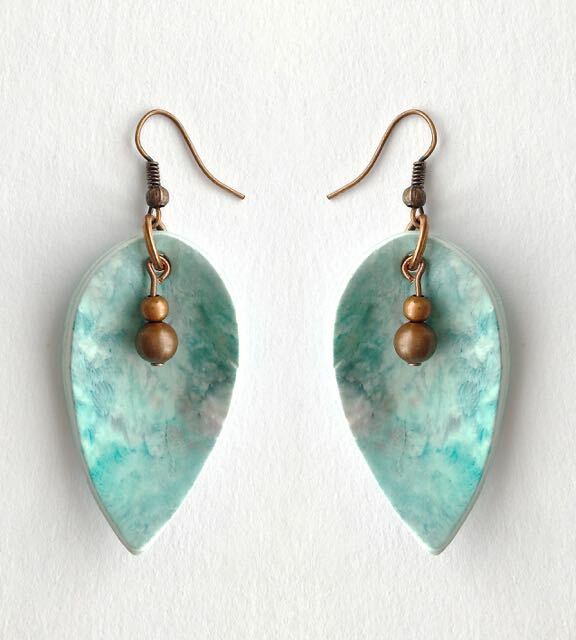 A larger spoon may create less curve vertically but horizontally as well causing the top of the earring to lay too flat. The clay should create a slight cup for the beads. 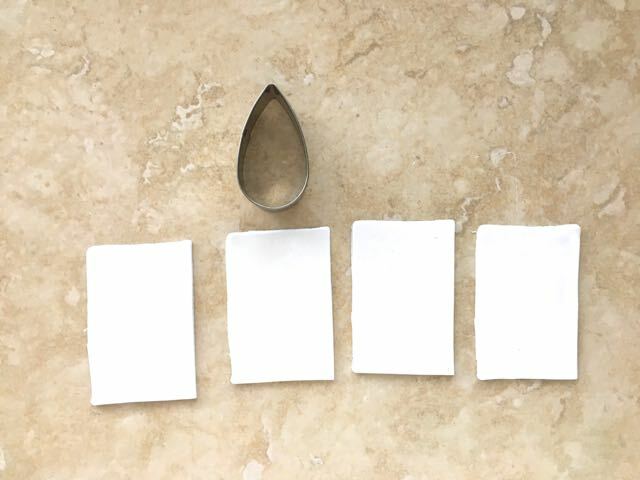 All spoons are not created equal so do an experiment with yours to see if the shape is what you are excepting. 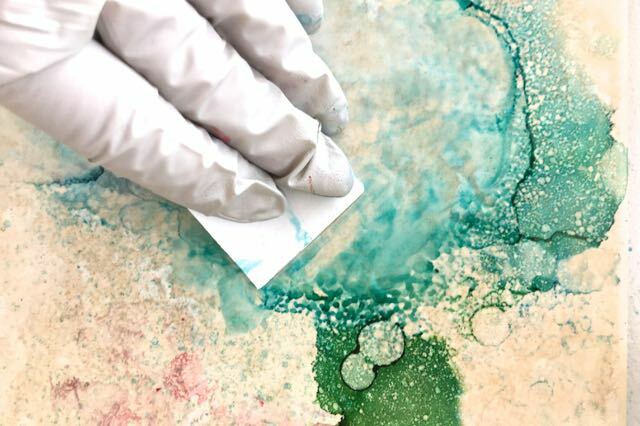 Placing clay dampened with alcohol on dried ink is another way to transfer ink to clay. 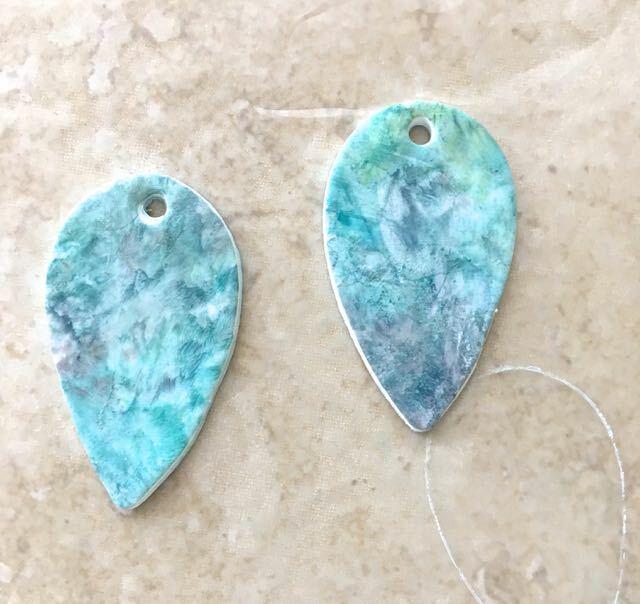 While this technique works best on light color clay, it can also be used on medium dark clay with dark ink colors. Contrasting colors also work well, like white and metallic gold and silver. Piñata metallics require thorough mixing so be sure to shake the container until you hear the mixing ball working inside.